Does your client drink alcohol on a regular basis and wish to quit? They probably feel that one or two glasses or beers at night helps them to relax after a stressful day and it's true that this can help them to unwind, however drinking on a daily basis, even a relatively small amount, is not good for anyone. Current research suggests that we should have a break from alcohol every few days in order for our liver to function optimally. Every night drinking can also lead to a physical and psychological dependence which is why it is another good idea to nip the problem in the bud, right now. 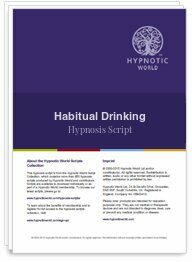 This Habitual Drinking hypnosis script is designed to help those who drink every night - however it can be used for anyone who would like to quit alcohol and gain control of their life. The script includes an induction, deepener and a powerful anchor that will help your clients to quit alcohol once and for all. Reduce your Alcohol Intake with Mindfulness.